AppOptics APM consists of two main parts: performance metrics gathered from the different services powering your application, and distributed traces that follow the path of individual transactions through the entire application stack. 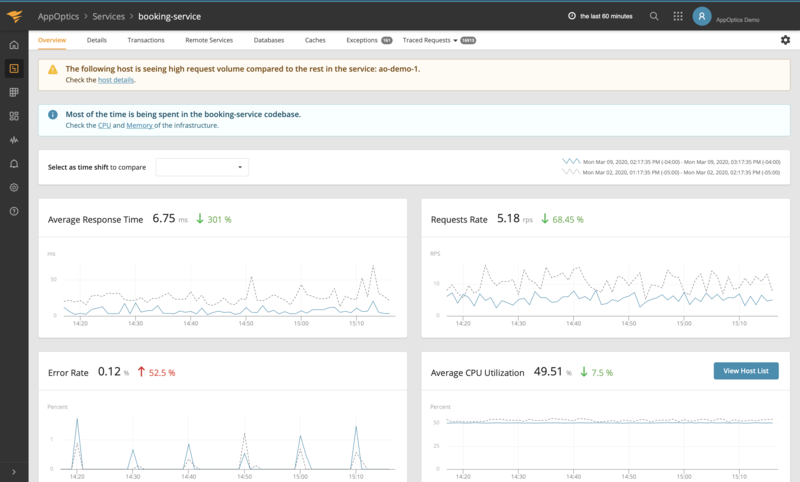 Using AppOptics APM, you can pivot easily between application metrics, traces, infrastructure metrics, and custom data to quickly solve performance problems. AppOptics APM and distributed tracing data is gathered by agents deployed in your application stack. These agents require no manual instrumentation or configuration to get started–learn more by picking one from the left-hand navigation menu, or just sign up for an account to be walked through install. Selecting a particular service, you will be taken to the Service Overview page. This page displays a number of charts that provide an overview of the application’s performance such as response times, HTTP calls, and service transactions. From the Service Overview, you can drill down on individual aspects of a service’s performance, understanding by-transaction performance; database, cache, and remote service usage; and inspect transaction traces that involved requests to this service.